"My daughter loves your video!" -Betsy Chasse, Director/Producer, "What the Bleep Do We Know?" 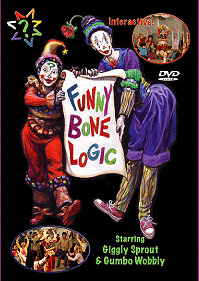 "Funny Bone Logic weaves a magic that begs taking part, your love and hope are infectious! I had a lot of fun watching your DVD." "I love The Funny Bone DVD! Living Folklore has created a space to gently teach children (and remind adults too!) some very important lessons about simplicity and the healing qualities of laughter, play, and mindfulness." "In a world that too often downplays the value of emotion, Giggly Sprout and Gumbo Wobbly tenderly help children to embrace and articulate a rainbow of feelings. This delightful and colourful duo have taken a bold step in prioritizing children's emotional intelligence." all content ©2009 Living Folklore, Inc.